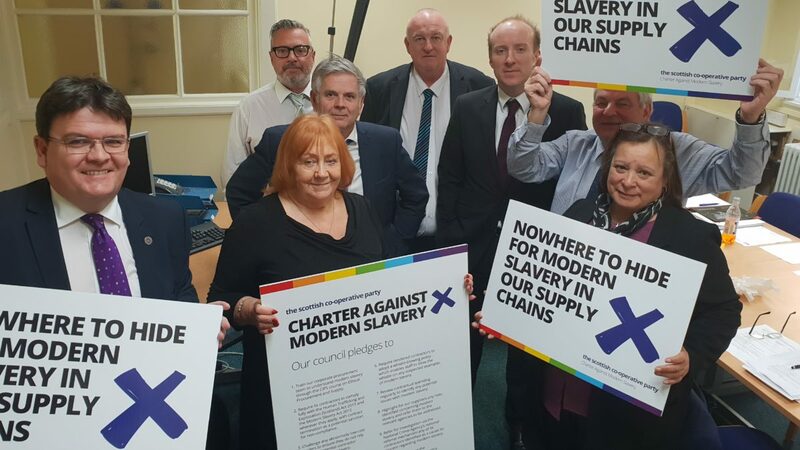 At Dundee City Council’s Policy & Resources Committee I was proud to second my Scottish Co-operative Party colleague Councillor Richard McCready on the motion to get the council to sign up to the Charter Against Modern Slavery. I supported this motion because it is important that we pay attention to the council’s supply chains and also important that we ensure that Dundee City Council takes the lead in the city in saying that human trafficking and exploitation are unacceptable in our city. Hopefully other parts of the public sector and of the private sector will consider their actions and follow our lead. Police Scotland have rightly drawn attention to this issue. It is often associated with sexual exploitation but it is not only sexual exploitation there is also the issue of forced labour. We should be vigilant about forced labour in our city and in the wider economy. We should be asking ourselves whether there are parts of the economy which we should be particularly vigilant about. Figures released earlier this year by Police Scotland draw attention to the 42% increase year on year in reports of human trafficking. It is very likely that this is just the tip of the iceberg. I was really pleased that Dundee City Council spoke with one voice, across political divisions, to support this policy. As a co-operator and a member of the Scottish Co-operative Party I was really delighted to be able to back a policy that builds on the work of the movement, particularly the Co-op Group and which has been developed by the Co-operative Party.